Message: We have gone with Mike many times and you simply cannot get a better guide that loves what he does. We always enjoy the trip whether we catch our limit or not. Message: I have gone fishin with Mike a few times and just about everytime we caught a few fish. there was one day when we went were we caught about 17 or 18 fish.They probly averaged 14 pounds. It was the greatest fishing trip ive ever been on. Message: Hope to see you on the water. I am from Jasper and do some crappie fishing on Smith. Would like to try striper fishing at some point. When I catch them on crappie gear all I hear is ziiinnng POW. Message: Recently took a trip with Mike. It was an awesome experience with a top notch guide. We reeled in 9 fish. One of which was a 5 pound spotted bass. I highly recommend it for anyone that loves fishing. Great time and I can't wait to do it again. Stripemaster's consists of Mike Perry, Mark Perry, and we have to mention Jessica, Mike's wife. She has spent countless hours on the lake with us and she built this website. Enough with the petty details. 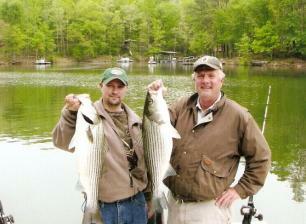 We have been striper fishing on Smith Lake for 10 combined experience. The first thing I would like to say about fishing is we are the newest guide service on Smith Lake, and we are not the guides you hear about that make "guarantees" and then go to sleep once we're fishing. We love striper fishing and will always work as hard as it takes to put as many fish in the boat as possible. It doesn't matter if you're a local angler trying to learn how to fish Smith Lake or you're an out of towner wanting a taste of Smith lake's world class striper fishing, we will always do our best to put you on fish. Our favorite time of year to striper fish is the spring. Nothing gets your heart pumping like seeing a big daddy striper "slurping" at your shad on top. In the spring the fish are fairly shallow, but always looking up, so we fish with planer boards and live shad. We move just fast enough to keep the lines moving and give the shad about 6-8 ft. of line to swim around on. We also catch a lot of fish on big redfins in the spring. All the rest of the year we use down rods with live shad, at various depths. A down rod is just a 2 oz eggsinker with about a 3 ft. leader, hung underneath the boat.